ETC has just added two exciting products to its lighting control line up: the Nomad software and Nomad Puck controller. Designed for situations when lighting professionals can’t bring their consoles with them, Nomad and Nomad Puck allow users to program and run shows from anywhere. 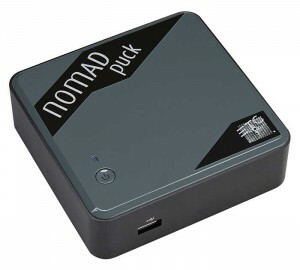 Nomad is a tiny device that attaches to PCs running either Microsoft Windows 7 or 8, or Macintosh OS X (Mavericks). It is available in four output counts: Nomad 256, which offers half a universe, Nomad 1024 with 1,024 outputs, and Nomad 1,536 outputs – all of which can be upgraded in the field without needing hardware changes – and Nomad 2048, which offers 2,048 outputs. Both Nomad and Nomad Puck can support external fader wings, and they can work with ETC control accessories, such as the Radio Focus Remote (RFR) and the iRFR and aRFR apps for Apple and Android devices.